My first grandbaby has arrived !!! Olivia was born right smack in the middle of Hurricane Irene....which made the original plans for her birth go right out the window. Miss Rosie's "Plan C" from her book, "Schnibbles Times Two"
Olivia and her folks are coming here for Christmas...can't wait !!! Home, it means so many things to so many people. To be honest, I took it a little for granted until my work has resulted in long periods of time away from home. I didn't realize how much I would miss hearing the geese fly overhead each evening at dusk, the way the rustling leaves sound in the evening breeze outside of my sewing room window, how pretty the sunrise looks through the wispy birch leaves and branches outside my bedroom window. How good your own bed and pillow feel after being gone for so long. Don't get me wrong, hotels are nice and it is really fun that someone else has to make the bed and scrub the toilet but they just aren't the same. Too bad we can't pack all of our memories and momentos into a suitcase for these trips. To just open the bag and instantly recreate your home inside the hotel room. Though packing my hubby into a small carry-on suitcase would be challenging (grin). I really appreciate my home when I get a chance to be there. Dust bunnies and all. 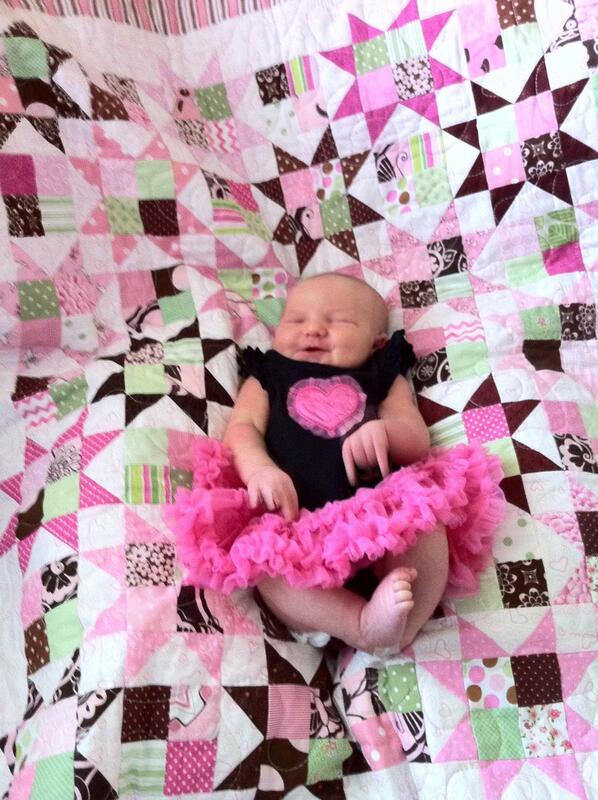 This is one of the quilts that were given to the first ten newborns when our hospital opened in October 2009. There were nine others with the same pattern just lots of different bright and fun prints. Sure wish I was quilting right now. Since I've started this new work project with all the traveling, I haven't even turned my sewing machine on in over 6 weeks. I am totally having quilting withdrawals. There are so many errands to run and other things to do when I am home that quilting gets pushed back. Finally stopped at Joann's and grabbed about 5 different quilt magazines so I could at least read about other people quilting. This pace should slow down by the end of the year. Just in time for Christmas. Sigh....Oh well, it is a job. So many out there don't have one that who am I to complain about mine. Hope you all get a chance to enjoy this beautiful spring weather. Home for the weekend from Southern California. So good to sleep in my own bed and spend time in my sewing room. Traveling on short flights in small planes isn't a lot of fun. Learning alot and my head is full of new facts. Hopefully I can keep them straight come Monday when it starts again. 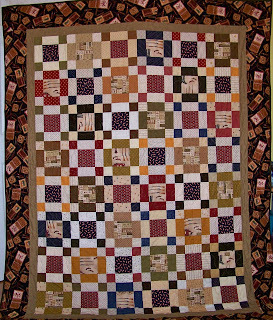 This is another of the quilts given as Christmas gifts last year. It was the only one that I managed to get finished before Christmas. The quilt went together pretty quickly. 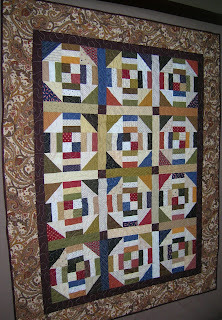 The block is based on one I found in the 2009 Quiltmaker's 100 Blocks collector's edition. It was called Texas Circle Around by Lynn Roddy Brown (lynnroddybrown.com). I changed the center to a four patch instead of a plain square. It is titled "David's Quilt". Sorry, most of my quilts get names like that. 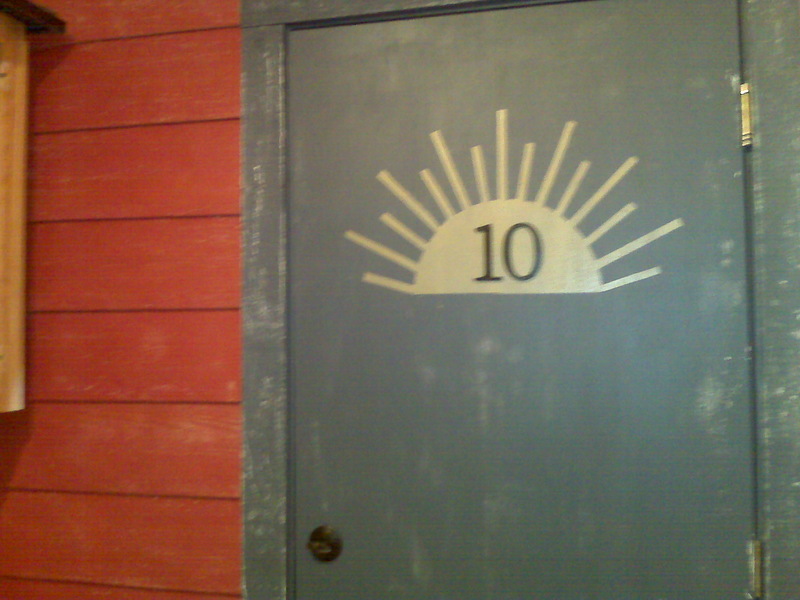 Not very imaginative but functional when you live with a person who, after living in our current home over 15 years, cannot remember our neighbor's names unless you include which house they live in. So we have "Jennifer down the street", "Tomas in the two-story on the corner", etc..
Well, got to get back to actually sewing instead of blogging. Time at home is very precious nowadays. Nothing new on the design wall yet. Just admiring the one I finally finished yesterday. All bound, label attached and ready to package up for delivery. This is one of the Christmas quilts I wasn't able to finish in time for Christmas. He did get to see the top at Christmas but it wasn't as exciting as getting the actual quilt. Have one more Christmas quilt to go, will be loading it onto the frame today. Note to self----do NOT plan on giving quilts as Christmas gifts again!!!! Has it really been almost a month since I last posted? Time has certainly flown by since then. I finally finished this baby quilt. It was a collaborative effort between myself and two other women from work. Seemed to take forever but that's because we only worked on it during our morning 15 minute breaks. Isn't this a cute pattern? I think the pinwheels turned out pretty well considering these two ladies are very new to quilting. I will be starting a new position at work on March 1st. It will require lots of traveling which equals lots of waiting in airports. I've made up a little sewing kit to try hand piecing while I wait. Ought to be interesting. I'll keep you posted. This is my great nephew, Elliott. He is the first "Grandbaby" for my little sister, Sally. Since my kids aren't in any hurry to have kids, my sister has graciously shared Elliott with me. Don't you just love the smell of new babies? They are so soft and precious. This little guy is obviously a happy camper. 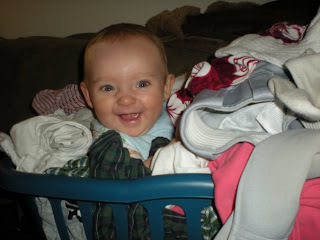 Playing peek-a-boo in the clean clothes. No shortage of love around here for this little guy. The refrain at Christmas in our house was "don't bogart the baby". For those of you too young to remember the word "bogart", the phrase basically means "don't hog the baby, you have to share him". It was so fun to have a little one around for Christmas. Hopefully next year one of my kids will be starting a family. Can't wait for my own little "Elliott". 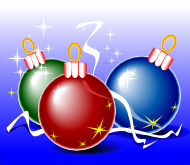 Do I get sick at Christmas? Seems to happen every other year. Had all of my kids and their significant others home for Christmas. Where am I the day after Christmas? In my bed under 4 blankets freezing. Then I'd get scorching hot and strip all the covers off. Just love the multiple trips to the bathroom that went with it. So hope your Christmas was better. Honest I haven't forgotten how to type. My hands have just been really busy sewing since my last post. Camera is down right now, so I can't post any pictures at the moment. Perhaps Santa will take pity on me and get me a new one this year (hint hint). I will for sure post pictures of the completed quilts before they're given away for Christmas. This is always such a busy time of year for many folks, including me. I keep promising myself that I won't plan on making quilts for Christmas, but somehow it just keeps happening. Need to get 6 finished before Christmas. Wonder if I should go shopping instead and plan on giving them next Christmas instead?....hmmm, sounding better each day it gets closer to Christmas. Have gotten two tops completed, one top is nearly finished and have 4 more to get done before Christmas. I will post pictures soon I promise. Hope you all have a great Thanksgiving !!! 2009 Please do not use my photos or reprint my writing without asking me for permission first. Thank you. Patty E.